The book Snowflake Bentley tells the story of a determined boy, William Bentley, and his curiosity for ice crystals. His quest to photograph snowflakes gave the world brilliant new pictures, wonders never seen before. Wilson Bentley was born in 1865 on a farm in Vermont where approximately 120 inches of snow blanketed the landscape each winter. 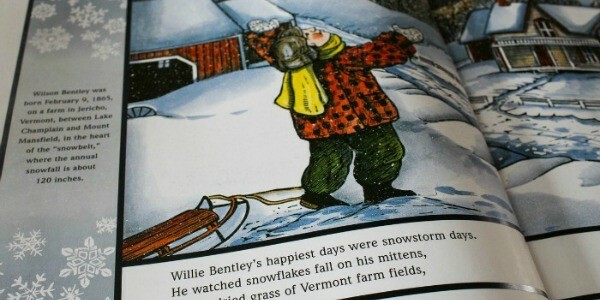 As a young boy Wilson observed snowflakes falling on his mittens, grass, and metal barn doors. Mesmerized by the crystals, he was determined to find a way to preserve them. While other children played in the snow, Wilson caught snowflakes and studied them under a microscope his mother gave him.He also observed and recorded the weather. Eventually, Wilson’s parents used their savings to buy him a microscope with a camera attached. With his new equipment he could magnify and photograph the tiny crystals. Neighbors laughed at him, but Wilson was persistent and determined, saying his photographs would be gifts to the world. 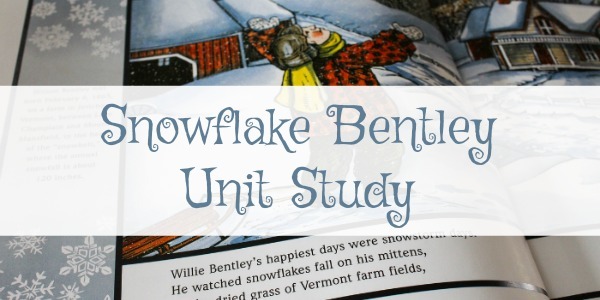 Read Snowflake Bentley with your children and use it as a starting point for a unit study. There is so much to be learned from the work of William Bentley. Your kids will have a great time studying it! Wilson Bentley would rise before dawn to capture his microscopic treasures. Dawn is the time of day when it is barely light (twilight), before the sun actually rises above the horizon. At that time of day Wilson photographed beads of water on spider webs and dew droplets on grass. Dusk, on the other hand, is the word used to denote the time between day and night, just before the sun sets. Take walks outside during dawn and dusk. What activities are taking place? What animals are active? Where is the sun in the sky? Compared to mid-day, are the temperatures cooler at these times of day? Vermont is in New England. Locate Vermont on the map. The capital of Vermont is Montpelier. Find the state capital. For handwriting practice, write Vermont. The Desk Atlas Of The United States from Geography Matters would be a great place to look for more Vermont information. Vermont is known for its production of maple syrup which is made from the sap of maple trees. Read From Maple Trees to Maple Syrup, by Kristin Thoennes Keller. Many snowflakes or snow crystals are hexagonal prisms. Hexagons are six-sided geometric figures. Practice drawing shapes with six sides. Practice counting to six. In the evenings, Wilson would produce slide shows of his fabulous snow crystal photographs for his neighbors and friends. People were amazed by the intricate designs. Cut delicate six-sided snowflakes out of white paper. 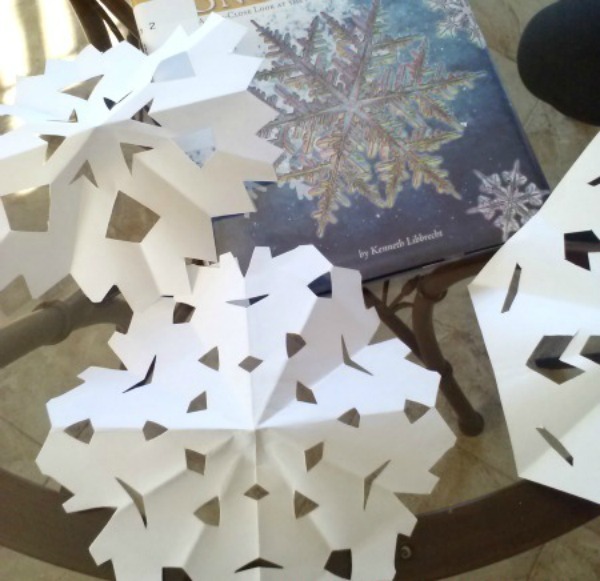 Use some of your snowflake creations to illustrate a snowflake book like Snow Crystals, by W. A. Bentley and W. J. Humphreys. There are three types of matter, solids, liquids, and gases. Water can be solid (ice), liquid (rain or water we drink), or gas (steam). To create steam, place water in a pot and heat on high. With caution, watch the steam (water droplets) rise from the pot. To make water solid, place water in a container and freeze. While the water is freezing, do an ice cube experiment. Place an ice cube on the driveway in the morning. Make sure it’s out of direct sun. Use a stopwatch to time how long the ice cube takes to melt. Later, at noon, place another cube on the driveway in direct sunlight. Start the stopwatch and record the time at which the cube completely melts. Try the experiment one more time at dusk. Compare the three times. Which cube melted fastest? Which cube melted slowest? Why? Discuss other items that melt, butter on a toasted bagel, ice cream in a cone, an ice cube in a cup of hot tea. Why do these things melt? On a cold evening, prepare hot chocolate for each family member. While the water is heating, have your child count out five miniature marshmallows or ten chocolate chips for each cup. After counting, watch for steam to rise from the water. When the water is hot, an adult should pour the hot water into cups, stir, and add marshmallows or chocolate chips. While the chocolate cools to taste, watch what happens to the marshmallows or chocolate chips. Wilson Bentley was a farmer. All the money he earned he spent on producing more ice crystal pictures. Wilson would either give copies of his photographs away as gifts or sell them for a few cents each. By 1926, he had spent fifteen thousand dollars on his work. The word “cent” means one hundred. There are one hundred pennies (cents) in one dollar. Set a pile of coins in the middle of the table. Identify each coin. Take a handful of coins from the pile. Count the value of the coins. Write the amount, using the cent sign, on paper. Younger children can place pennies in piles of five or ten. Cheryl Bastian and her husband Mike have seven children and have been homeschooling since 1993, Cheryl organized and led a Central Florida support group, mentors current leaders, and remains active in the homeschooling community. As an author and speaker, Cheryl encourages parents to embrace the education and training of their children. Her books and resources are available at www.cherylbastian.com. This article was originally published in the Homeschooling Today Magazine 2016 winter issue. Get more quality, relevant articles like these delivered to your door or to your inbox with your subscription to homeschooling today!